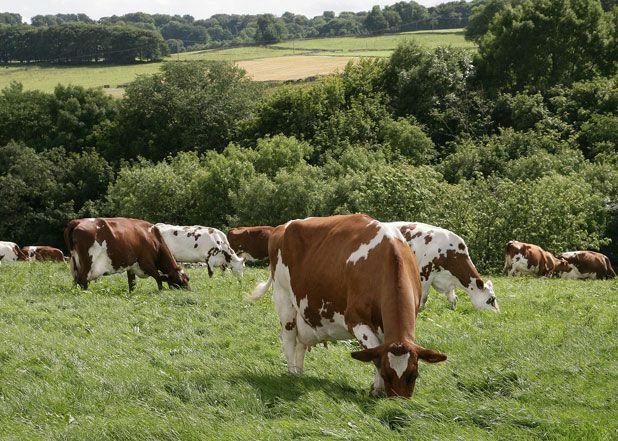 The famous brown and white Ayrshire dairy cow isn't anything like as ubiquitous a sight as it once was, dotted across rolling green Ayrshire pastureland in the late 19th and early 20th centuries. Progressively interbred with and usurped by the more productive and thus much more common black and white Holstein cow, even if they're to be commonly found elsewhere in the world from Finland to New Zealand, Australia and Malaysia, they're the rare breed these days in their native land. But don't assume we're soon to see the back of these distinctive bovines. Originally known as Dunlop and later Cunningham cattle and first recorded on an official basis in the 1870s, the indomitable Ayrshire's predominance in its heyday led to the formation of the Ayrshire Cattle Society in 1877, a body which in the 21st century still endeavours to keep the breed at the forefront of modern dairying. Favoured for their hardiness, efficiency, good temperament and above all superior milk – so good it stands up to blind taste test scrutiny against its rivals – you'll still find certain Ayrshire farmers standing steadfastly by the Ayrshire as a breed. 'Traditionally she has higher components within her milk, higher fat and protein,' says Hugh Woodburn, founder of the Woody's Ice Cream brand and keeper of a large herd of Ayrshires at Killoch Farm near Galston. 'Market research has proven for her milk to have a superior taste to that of the black and white cow,' he adds. Woodburn began making ice cream approximately 12 years ago, during a crisis for dairy farming in the UK when profits slumped and many farmers were forced to diversify to survive. Producing around fifty different flavours of fresh ice cream in small batches, often bespoke to order, Woody's have become a well-respected and recognised brand in an increasingly competitive ice cream market in Ayrshire and the west of Scotland (see sidebar). The majority of Killoch Farm's milk is still sold to a dairy on a daily basis, but they keep enough back to manufacture about 40-50,000 litres of ice-cream annually. Hugh recently handed over the running of Woody's to his daughter Jill Woodburn, allowing him to concentrate on, ahem, milking the most valuable asset of their business. Jill Woodburn and family produce over 50 varieties of ice-cream, fresh fruity sorbets and frozen yoghurts, sold around the area and at their new Ice Cream Parlour and Dessert Bar in Mauchline.